If you are outside the borders of Israel, it is doubtful that you will hear one word about Israel under attack. Whether it is Iranian made missiles slamming into Israeli towns in the South from Gaza or an IDF border patrol in the Golan Heights being ambushed by roadside bombs courtesy of Syria, it just does not make the news. Sure, you may see AP or Reuters reporting it, but local TV, radio and newspapers in the US, Canada and Europe see it but don't use it. Islamic terrorism and Jihad have become so frequent in and around Israel that these violent incidents are not considered news worthy. Solution: Have the Israeli Ministry of Foreign Affairs get the news out through their Consulates throughout the world. Oh ... their on strike because they don't get paid enough to feed their children. Okay, then let's get the Jewish Federations to report the news on their Websites, send it out by email to their members and place this critical news in their local media. Or will we allow a normalization of terror to continue? As terrorism becomes a perverse norm it encourages more acts of terrorism to occur. We need to stop complaining and get the news of terror attacks on Israelis, on Jews into every Jewish and Christian Website, into the newspapers which decorate commuter trains, planes and Jewish events. Where can we secure this news? The IDF - Israel Defense Forces - Facebook and Twitter pages. The war against Israel is not about Israel. It is not about land. It is about murdering Jewish men, women and children. It is about Islamic Jihad that must be exposed. Only the Jewish Federations have the manpower, reach and natural understanding to become Israel's external PR arm. Jerusalem, Israel --- 03/05/14 ... The Israel News Agency (INA) reports that Prime Minister Benjamin Netanyahu held a series of security consultations prior to approving the IDF action that began this morning (Wednesday, 5 March 2014). The INA states that after the seizure of the ship, the Prime Minister spoke with Israel Defense Minister Moshe Yaalon, IDF Chief-of-Staff Lt.-Gen. Benny Gantz and Mossad Director Tamir Pardo and praised them for the quality intelligence that led to the action and for the precision with the operation was carried out. Prime Minister Netanyahu said: "I would like to commend the IDF, the intelligence services of the State of Israel and – of course – the navy commanders and personnel who carried out a perfect operation to intercept a secret Iranian weapons ship. At a time when it is talking to the major powers, Iran smiles and says all sorts of nice things, the same Iran is sending deadly weapons to terrorist organizations and is doing so via a ramified network of secret operations in order to send rockets, missiles and other deadly weapons that will be used to harm innocent citizens. This is the true Iran and this state cannot possess nuclear weapons. We will continue to whatever is necessary in order to defend Israel's citizens." The Israel News Agency reports that the M-302 rockets were on route in an elaborate smuggling operation orchestrated by Iran. Manufactured in Syria, the rockets were flown to Iran, then shipped from its Bandar Abbas port to Iraq to cover their tracks and loaded onto the civilian cargo ship destined for Sudan. From there, they were to be smuggled overland through Egypt to the Gaza Strip said IDF spokesman Lt. Col. Peter Lerner. 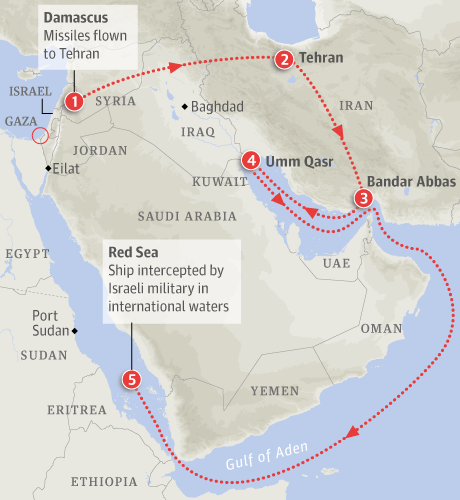 Israel forces intercepted the ship, the KLOS C, in international waters off the shores of Sudan and Eritrea, 1,000 miles from Eilat, Israel's southernmost point and only Red Sea port, Lerner said. The Israel News Agency states that the M-302 rockets have a range of up to 100 miles and would have significantly improved the capabilities of Gaza terror organizations, putting nearly all of Israel in their range. Joel Leyden contributed to the above news report.